Last time, we used factor analysis to come up with factors we could use to describe the performances of Super Bowl-winning quarterbacks. Now, we’ll try to use those factors to compare the performance of our candidate quarterbacks who won at least 3 Super Bowls. Recall that one purpose of factor analysis is to identify underlying factors that you can't measure directly. For example, the members of a committee at a hospital design a survey with questions that assess 3 underlying factors: timeliness of service, accuracy of service, and courteousness of service. 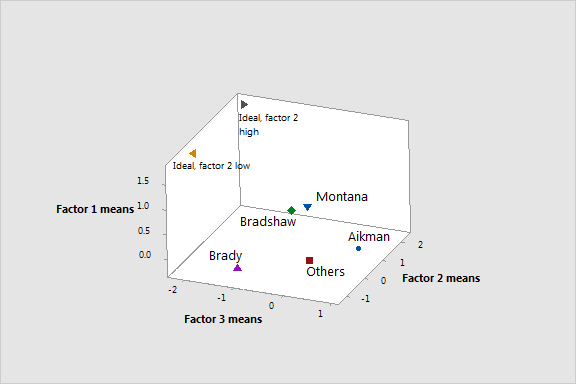 The committee members can use factor analysis to combine the responses for many different questions into 3 factors. Factor 1: How well the winning quarterback played. Higher is better. Factor 2: Competitiveness of matchup. Far from 0 is better, either low or high. Factor 3: How impressive the victory was. More negative is better. The most typical statistical analysis for describing a group, like the data points for Joe Montana, would be to measure their distance from the average factor point. (In this case, the average factor point would be where every factor equals 0). Because our factors are directional, a quarterback could be far from the average point, but in the wrong direction. Instead of looking at the distance, I’m going to measure the distance from a hypothetical great performance where each factor has its best value attained so far. Because either high or low values are good for factor 2, I’ll check the distances for 2 different points. For factor 1, the best possible point was 1.773 by Jim Plunkett. For factor 2, the best possible point is either Joe Montana’s 2.322 or Tom Brady’s -0.386, depending on whether we take the low side or the high side. For factor 3, the best value is Tom Brady’s -2.144. This 3-D scatterplot shows the mean value for each candidate quarterback, the mean value for all other performances by quarterbacks who won Super Bowls, and the 2 ideal values. Among the quarterbacks with 3 or more victories, Montana’s factor means are the closest to the best factor values ever achieved when you value how thoroughly a team dominated the other. Montana’s distance is a half unit closer to this ideal game than Terry Bradshaw is. Interestingly, although Tom Brady has the lowest value of factor 2 among all quarterbacks, it’s Terry Bradshaw who is the closest to the ideal point when you consider the ideal game to be winning a competitive matchup. The difference in the means is not as striking here. Bradshaw is within 0.22 of both Tom Brady and Joe Montana. Terry Bradshaw deserves a lot of credit for beating Roger Staubach-led Cowboys teams twice. Tom Brady's achievement in beating the highest-rated loser ever is noteworthy. But Joe Montana comes away with credibility for beating the Ken Anderson-led Bengals and the Boomer Esiason-led Bengals in competitive Super Bowls, as well as blowing out John Elway and Dan Marino in less-competitive matchups. With these data, and these criterion, I'll turn to Joe Montana as the best superbowl quarterback ever. 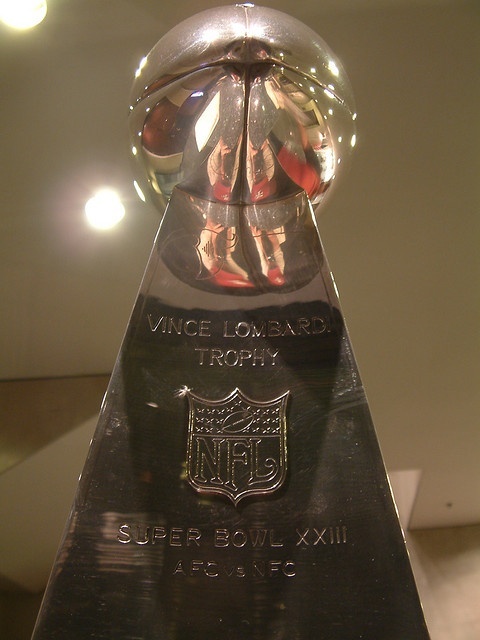 The image of the Lombardi Trophy from the 49ers victory in Super Bowl XXIII is by youraddresshere and is licensed under this Creative Commons License.